Students will walk away with several sets of handmade polymer clay statement earrings! They will design and create their jewelry pieces in polymer clay, incorporating fun embellishments live carving, positive and negative space, imprinting, and color palettes. Finished pieces will be assembled with several options ranging from traditional metal hardware and wire to yarn, embroidery floss, and chording. 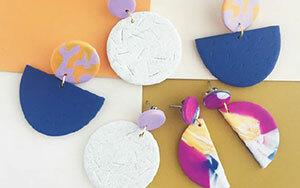 This is a fun and easy class to relax, let your creativity run wild, and become addicted to making sculpey clay jewelry! Recommended for middle schoolers, high schoolers, and adults. All supplies provided for a $10 fee payable to your instructor at the first class.